Location was amazing. Cleaning service daily was a nice touch. Host was very friendly. Good location, generally clean place. Daily cleaning. Outdoor Jacuzzi. The location was excellent. The house was very clean and comfortable. The hot tub and the outdoor space were lovely. The property and host were both excellent. 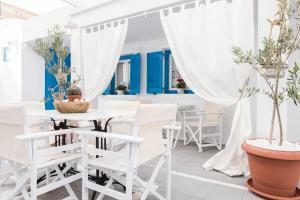 The location was in the centre of Fira, close to restaurants, bars and the bus station. It was clean, spacious and perfect for a group of friends. There was a hot tub (nice touch!) and locally made wine that was refilled each day. There was also a cleaning service each day, which was very appreciated. Would highly recommend. Iokasti Villa location is excellent; very short walking distance to the center of Fira (restaurants, cafes, shops). Vera (property manager) is great, very responsive and flexible. She met us upon arrival to give us directions of the island, she was nice enough to propose a tour of the whole island with Nikos, which was really wonderful. Thank you! Great location near to main street and attractions. We enjoyed our breakfast time and tea time at the garden! Vera was helpful person and thanks to her for everything! Highly recommended this place! Host is very friendly. Provided a lot of useful information about Santorini. She helped to safe keep our luggages when we arrive early. Villa location is very convenient. We can reach restaurants, shops and attractions easily. Will like to stay here again. The courtyard of the property was a real attraction and made the house an excellent choice. The villa was situated in a perfect location, very neat and cleaned on a daily basis. Vera (property manager) was superb, very attentive and welcoming and went above and beyond to make our stay wonderful. We loved our stay at Iokasti! We were 3 friends celebrating our 40th bdays and we liked EVERYTHING!!! 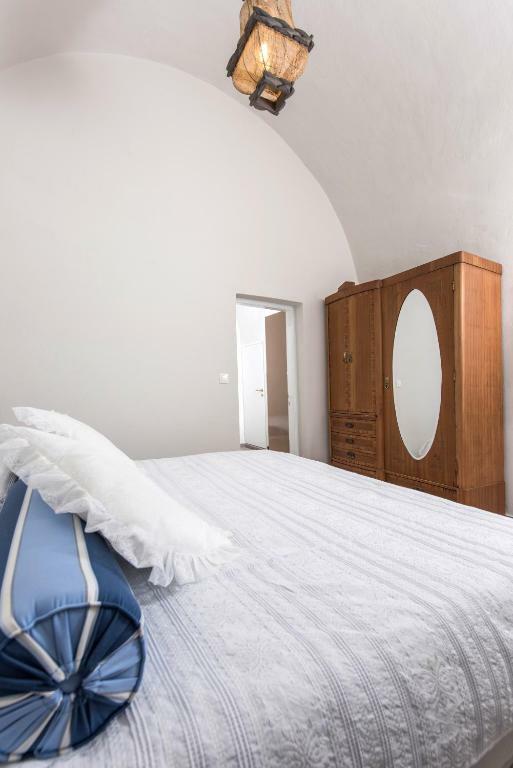 Iokasti Villa is exactly as the website photos, actually a little more spacious. Location is great! 5 min walk to the caldera. Restaurants, shops, bus station and noisy night life are 2 blocks from the Villa. Awesome Patio and jacuzzi to enjoy in the night when you return from walking arround in a long hot day! All the villa with great A/C and wifi. Housekeeper every day will leave the Villa spotless. Vera and Amalia are incredible hosts, arranged transportation from the airport to the Villa (our flight arrived at 4:45 am and there was the mini van waiting for us), arranged taxis, boat tour, and very good tips of bars, restaurants and things to do in the island. Definitely 100% recommended, don't be afraid because what you see in the website it's nothing compared of how beautiful this Villa is and location is very convenient. Lock in a great price for Iokasti Villa – rated 8.8 by recent guests! One of our best sellers in Fira! Set a few steps from Archaeological Museum of Thera in Fira, Iokasti Villa features romantic, traditional interiors with high-quality hand-picked furniture. The private house is a few steps from Megaro Gyzi. 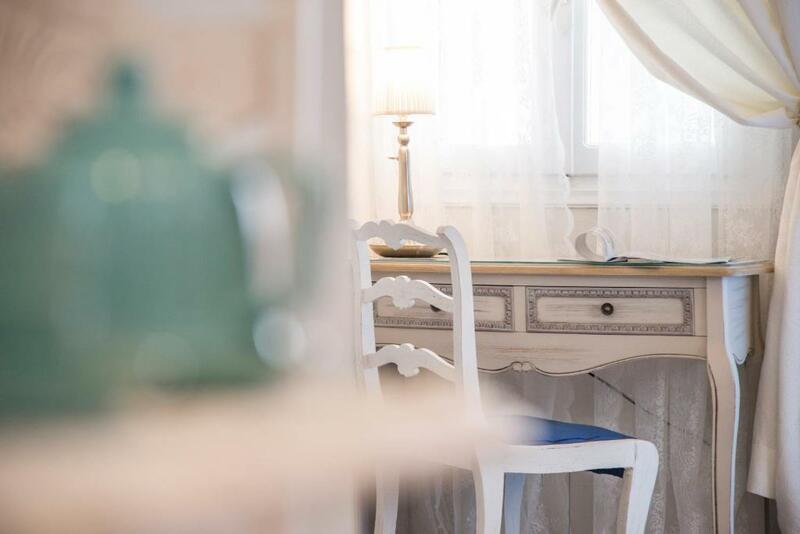 The villa offers a spacious living room with a smart LCD and a keyboard, books and guides, a working table, a fully equipped kitchen with dining area, and a bathroom with shower and bath amenities. 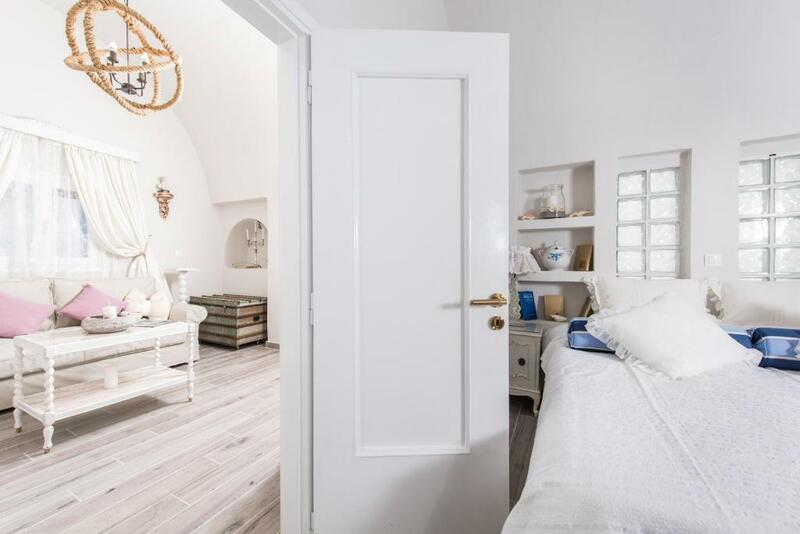 It has 2 connecting bedrooms with orthopedic mattresses. The second bedroom has an in-room toilet with easy-shower and a second door that leads to the front yard. The museum of Prehistoric Thera, the shopping area and a bus/taxi station are within walking distance from the property. Santorini Airport and port is 4.3 mi away. When would you like to stay at Iokasti Villa? 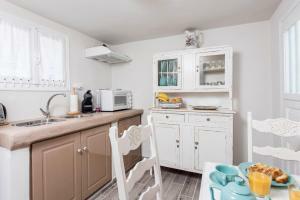 This holiday home features a DVD player, kitchen and air conditioning. Iokasti villa is a lovely fully renovated private house in the heart of the city center. 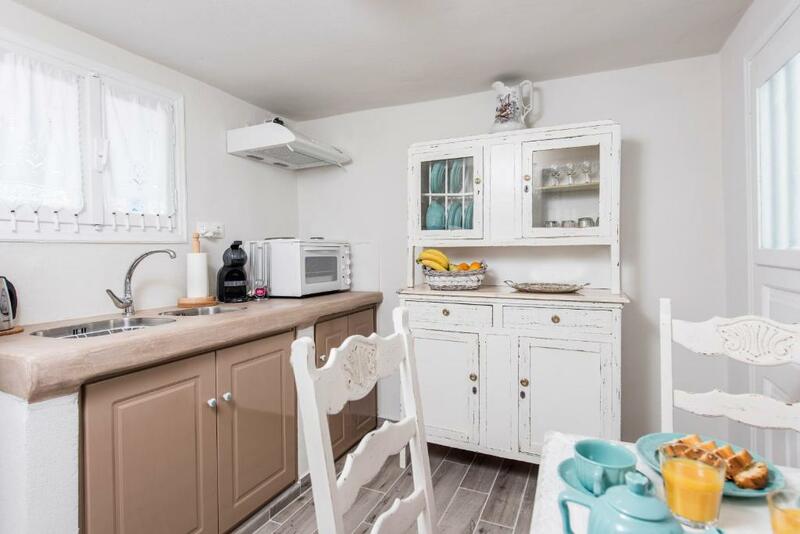 Located at the traditional neighborhood, the house is fully equipped with a living rom, a kitchen, two bedrooms, a main bathroom and an in room bathroom, a spacious patio/terrace with a dinint table, sunbeds and a hot tub (from the 1st of April 2016). 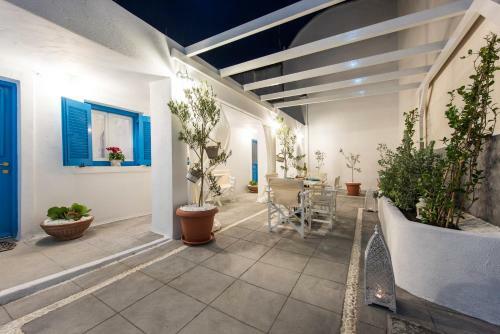 The house operates for the first time and is ready to welcome and offer a great stay in Santorini. I work in the hotel business all my life, in Greece and abroad. I love traveling, love meeting new people and doing my best to offer them warm hospitality, any assistance and special tips so as to enjoy an unforgettable stay in our beautiful island. Fira is the center of the island of Santorini. Evrybody meets here for several reasons, either to wonder around to the beautiful traditional paths and the uniqe caldera, or to enjoy a night out. Fira villa has the commercial part and the traditional more quiet part. Public transport is within walking distance and public parking as well. House Rules Iokasti Villa takes special requests – add in the next step! Iokasti Villa accepts these cards and reserves the right to temporarily hold an amount prior to arrival. Please inform Iokasti Villa of your expected arrival time in advance. You can use the Special Requests box when booking, or contact the property directly using the contact details in your confirmation. The adjoining bedroom would be good for a family with young children but not great for adults. The ensuite bathroom was tiny. The shower was not useable. Given the price of the property and close proximity to the airport, it may be a nice gesture to pick up guests as part of the cost instead of making them take a taxi. Some of the furniture in the house could be renovated. The second bathroom is a little bit small for shower, but it's totally fine if you only use the toilet in it. The apartment was only 1 minute walk from the Fira bus station. The room was really beutiful and clean. Very good apartment in total. Bathroom no shower curtain so the floor always wet and uncomfortable. This is a city villa so lack of sea view. A little tight on space but that is to be expected in a little island setting.Tiny bathrooms with little room to keep things. A tad bit cold in the living room. Wonderful villa will be back again! The cleaner came every day which was great, but at times interfered with us being able to relax in the villa, especially one day where a small child and another woman were also present. She also threw out some of my friends medication - pills in a packet sitting on the nightstand. On our arrival the host was so friendly, and spent 15 minutes just showing us everything, explaining the area, offering options of what to do and where to go. The villa was not hugely spacious, but comfortable and furnished very nicely. Beds were comfy. Hot tub outside was great. On arrival into Santorini there was no transport (which had been arranged) - this was disappointing but when explained we were happy with the explanation. Furniture is generally old (I suppose that is the style of the place). Bathrooms are awkward, tight and the locks can't be open from the inside normally. Photos looks better than in person.